Australian Under 20 Rugby Union captain Liam Gill has joined another winning team as the latest Brand Ambassador for Kia Motors Australia. Gill is fast carving himself a place in Australia’s rugby union’s future with some outstanding efforts in his role as openside flanker for the Queensland Reds in the FxPro Super Rugby, and the 19-year-old has been rewarded with the captaincy of the Australian team for the Junior World Championships in South Africa next month. “”I’m thrilled to be given another opportunity at the Junior World Championships _ it’s a great tournament to play in,” Gill said. Kia Motors Australia Chief Operating Officer, Tony Barlow, said the decision to invite Gill on board as a Brand Ambassador was an easy one to make. “Liam is an exciting young player making his way in a very tough and demanding professional sporting endeavour through determination, hard work and undeniable talent,” Mr Barlow said. Gill said the opportunity to be associated with Kia was one he valued. “Any sportsman strives for improvement in their own sphere, but they can also recognise the efforts and success of others, and Kia is obviously a company that has planned and prepared well for its own challenges,” Gill said. The all-new Kia cee’d made its world premiere yesterday (Tuesday, March 6) at the 82nd Salon International de l’Autoin Geneva. Joining the Kia cee’d in Switzerland, the Ray EV (electric vehicle) and the Track’ster concept make their first appearance before a European audience. “The three Kia premieres taking place at Geneva cover a broad spread of automotive segments and highlight the diversity of our present and future product line-up,” commented Thomas Oh, Senior Executive Vice President and COO, Kia Motors Corporation. Designed, engineered and manufactured in Europe, exclusively for the European market, the new cee’d hatchback is more sophisticated, more efficient, more refined and delivers a more engaging driving experience than its predecessor. The new cee’d will build on the success of the original model, further establishing Kia as one of the leading automotive brands in Europe. Longer, lower and sleeker than the original model, the 4.3-metre long new cee’d hatchback has a streamlined silhouette shaped by extensive testing in Kia’s state-of-the-art wind tunnel at Namyang, in Korea. Higher quality cabin materials and a broader range of high-tech equipment will ensure the interior of new cee’d matches the premium exterior appearance and competes with best-in-class rivals across Europe. Across most of Western Europe, the new cee’d will be available with two gasoline (1.4 MPI, 1.6 GDI) and two diesel (1.4 WGT,1.6 VGT) engines offering power outputs from 66 to 99kW. The highlight of the gasoline line-up is a 1.6-litre Gamma GDI engine, which was named one of ‘Ward’s 10 Best Engines’ from WardsAuto World in 2011. Newly introduced to European customers in the all-new cee’d, the 1.6 GDI features the latest gasoline direct injection technology to maximize power (99kW) and torque (165 Nm) outputs. Coupled with the 1.6 GDI is an all-new Dual Clutch Transmission (DCT) developed in-house. Utilizing two separate transmissions contained within one housing, the DCT delivers smooth gear shifts for maximum driving comfort, lowers fuel consumption and reduces CO2 emissions compared with the previous conventional automatic transmission. The 1.6-litre VGT turbo diesel engine delivers a peak output of 94kW and maximum torque of 260 Nm. New cee’d models incorporating Kia’s EcoDynamics technologies, including ISG (Start/Stop), low-rolling resistance tires and an alternator management system (AMS), with this diesel engine achieve impressive fuel consumption of 3.7 l/100 km and CO2 emissions from just 97 g/km. Thanks to continued efforts to reduce fuel consumption and emissions without sacrificing engine response or power output, Kia’s updated engines in the new cee’d range have achieved an average 4 percent improvement in fuel consumption across the range. A well kept secret pre-show, the wagon version of all-new cee’d was revealed by Kia’s Chief Design Officer, Peter Schreyer, during today’s Kia press conference. Full details of this important model will be confirmed closer to its European on-sale date, later this year. Unveiled in December 2011 and now on sale in Korea, the Kia Ray EV is a zero-emissions city car with a range of up to 139 km (86 miles) on a single charge – which takes as little as 25 minutes using a fast charge system. The 3.6-metre long, front-wheel drive Ray EV is powered by a 50kW electric motor and a high-capacity 16.4 kWh lithium-ion polymer battery pack. Though developed exclusively for the Korean market, the Ray EV showcases Kia’s technical expertise in developing a battery electric vehicle and highlights its commitment to provide a comprehensive technical solution to reduce dependence on fossil fuels. First shown at this year’s Chicago Auto Show and now making its European debut, the tough looking Track’ster concept is based on the Kia Soul, but with even more attitude. It is designed to be a bold interpretation that challenges people’s conceptions of what a sporty Kia could be. Kia‘s Track’ster features a 2.0-litre turbocharged gasoline engine producing 186 kW – transmitting that power to all wheels via an electronically controlled four-wheel-drive system. A short-throw six-speed manual transmission is engaged via a stubby spherical shift lever. Lowered sport-suspension, enlarged brakes and wheels that have been honed for maximum performance give the Track‘ster impressive handling. Also on display at Geneva is Kia’s new IVI (in-vehicle infotainment) concept, first shown at the Las Vegas Consumer Electronics Show in January, which offers a glimpse into the future of feature-rich information and entertainment systems. Kia Motors Australia has launched its fourth-generation Rio setting a new packaging benchmark in the light passenger vehicle category and introducing a choice of 3-, 4- and 5-door body styles across the range. The new Rio, which is available in S, Si and SLi trim levels, combines European flair, Australian drivability with Korean spice and starts at just $16,290. The range topping SLi comes standard with LED daytime running lights and 17-inch alloy wheels fitted with a low profile, high performance 205/45/R17 Continental tyre as standard, making it one of the most feature packed vehicles in its class. “Rio is a crucial member of the Kia family,” said Kia Motors Australia President and CEO Mr MK Kim. 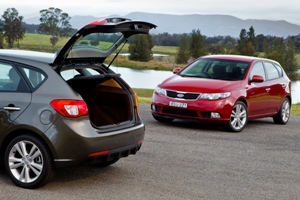 “As the car that introduced so many Australians to Kia, its role as an ambassador cannot be overstated. Like the Sportage, Cerato and Optima before it, the new Rio’s suspension and running gear has benefited from a stringent program of local optimisation. The Ride and Handling Dynamic Program included comprehensive local testing and fine-tuning to ensure responsive handling while maintaining stability, ride quality and refinement – in line with the discerning Australian customer’s expectations. The three bodystyles will be available with a choice of two engines matched to either a 6-speed manual or 6-speed automatic transmission with manumatic (manual and automatic) shift gate in the Si and SLi trims and either a 6-speed manual or 4-speed manumatic transmission in the base model S.
The 1.6L Gamma GDi petrol engine is fitted to both the midrange Si and top of the range SLi Rio models. The Gamma is the smallest Kia engine yet to benefit from the application of GDi (Gasoline Direct Injection) technology and develops 103kW at 6300rpm and 167Nm at 4850rpm – a 13 per cent improvement in power over a conventional Gamma 1.6L MPI fed engine. The base model Rio S comes with a 1.4L MPI 4-cylinder petrol powerplant with DOHC and CVVT and produces 79kW of power at 6300rpm and 135Nm of torque at 4200rpm. That is a power boost of 9kW and a torque increase of 10Nm over the outgoing model. Safety is a non-negotiable subject at Kia. Five-star crash integrity is the target of every new car while the standard inclusion of six airbags and electronic stability control across the range is designed to keep Kia customers and their families as safe as possible. An all-disc braking system with 256/262mm (front/rear) diameter discs (S and Si models) and 280/262mm diameter discs (SLi), HAC (hillstart assist control), ESC (electronic stability control), ABS anti-lock brakes, EBD (electronic brake distribution) and BA (brake assist) systems ensure all new Rio owners have the latest in vehicle control systems. This comprehensive array of electronic safety acronyms are overseen and monitored by the new Vehicle Stability Management program. VSM utilises the computing power of a central ECU to seamlessly integrate the operation of all the traditional active safety systems. If required, six front, side and curtain airbags offer protection to occupants in the event of an accident while night time driving is made safer by the availability of projection headlamps and new front ‘cornering’ lamps. Cruise control from the Si model up and daytime running lights, 17-inch alloy wheels, projection front headlamps, static cornering lamps, auto light control and an enhanced brake package in the range topping SLi, makes Rio one of the most feature packed models in its category. All models come with Bluetooth® connectivity and a radio CD player with MP3 compatibility plus AUX, iPod and USB connections – all controlled remotely from the steering wheel for added convenience and safety. Electric heated side mirrors are also standard across the range. The 5-door Hatchback is the first body shape to be launched in Australia. The 3- and 4-door variants will hit Australian roads in early 2012. Target CO2 emissions for the model range start at just 133 g/km making it a top contender in the government’s Green Vehicle Guide. Kia Motors’ long-running support of the Australian Open tennis continued today with the handing over of 101 specially-equipped courtesy vehicles to keep the tournament’s players, officials and guests on the move. In handing over the Kia Courtesy Fleet to Tennis Australia’s CEO Steve Wood, KMAu President and CEO M.K. 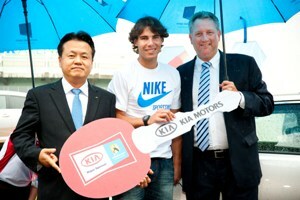 Kim reiterated Kia’s ongoing support for tennis in Australia. “Kia is a proud sponsor of the Australian Open, one of the world’s great sporting events, but more than that we are very pleased to be involved with the sport at many other levels in Australia, “Mr Kim said. “Through Tennis Australia Kia supports the junior coaching program to help identify and develop the next generation of Australian Open stars. Accepting the Kia Courtesy Fleet on behalf of Tennis Australia, Mr Wood acknowledged the importance of the Kia cars to the logistic success of the Australian Open. The majority of the courtesy fleet_73 vehicles_are Australia’s favourite people-mover, the multi-award winning Kia Grand Carnival which can move up to eight people in comfort. Also on the fleet are Kia’s exciting new mid-sized sedan, the Optima, the award-winning SUV pair of Sportage and Sorento, the Cerato small car and the eye-catching Soul. 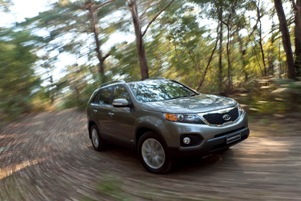 The Kia courtesy fleet will be driven by about 20 specially trained volunteer drivers who expect to clock up more than 300,000 kilometres in thousands of journeys during the 2011 Australian Open. (SEOUL) September 30, 2010 – Kia Motors celebrated the world premiere of its all-new, eye-catching, compact electric POP concept car at the 106thMondial de l’Automobile in Paris. Spotlighting Kia’s increasing focus on striking design and new technologies, the chrome-coloured, three-metre-long three-seater POP with its electric drivetrain, oblong-shaped side windows and front-hinged doors took centre stage on Kia’s Paris Show stand. Unconventional features of POP – the striking side-window design, the high-tech feel of the dot-pattern head and taillights, back-lit front grille, rear-view cameras in each door, full-length glass roof, and the simplistic look of the wheels – all point to inspiration from outside the usual automotive spheres, such as gliders and high-speed bicycles. Inside, the purple colour scheme creates a calm and peaceful environment within the space-ship like cabin. Facing the driver, a small piece of plexi-glass in front of the steering wheel shows a Transparent Organic LED (TOLED) display for speed, battery charge, and the other main readouts, when the car is running. At other times it is totally transparent. To the right of the steering wheel, a sculpted, chrome-look panel features only one button, with every other function (audio, sat-nav, climate control, etc) controlled via an animated touch screen. The front seat is a sculpted bench, with interesting, flowing lines, while the rear seat is positioned at an offset angle, resulting in remarkable legroom for a 1740 mm wide car with a wheelbase of just 2055 mm. Designed to accommodate a single passenger, this seat is a two-part affair, with a base that flips up when not in use and a backrest and a headrestraint integrated into the headlining. 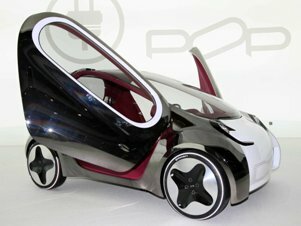 POP is a fully-electric, zero-emissions car with a 50kW, 190Nm motor. It’s powered by highly efficient, compact lithium polymer gel batteries and is fully rechargeable in just six hours. Top speed is 140 kph, with a maximum range of 160 km on a single charge. The POP concept was designed by Kia’s European design team under the direction of Peter Schreyer, Kia’s Chief Design Officer, and Gregory Guillaume, Kia Europe’s Chief Designer. In addition to POP, Kia is hosting the European debuts of the all-new Kia Optima sedan and new versions of the Kia Sportage at the Paris Show – production models which reinforce the company’s commitment to developing its design language – and putting this into practice with real-world models. Embodying what Peter Schreyer calls “a bold, athletic and visual sporting energy”, the Kia Optima sedans on display feature Europe-specific high-tech powertrains and introduce Kia’s new ‘U2’ 1.7-litre VGT diesel engine (100kW) and the all-new technically-advanced ‘Nu’ 2.0-litre CVVL (continuously variable valve lift) gasoline engine (125kW). Building on the immensely positive response of media and public to the new Kia Sportage, the model line-up is being expanded to offer two smaller capacity engines with fuel-stretching technology and exclusively matched to 2WD drivetrains and six-speed manual transmissions. For Sportage, Kia’s new 1.7-litre ‘U2’ diesel engine is tuned to generate 85kW while the 1.6-litre ‘Gamma’ gasoline engine delivers 100kW. Both new engines will offer emissions and running costs that are among the very best in class. Demonstrating Kia’s ongoing commitment to minimising its vehicles’ impact on the environment, the manufacturer’s Paris stand also features three environmentally-focused vehicles in a special ‘green zone’. The Kia cee’d and Venga low emissions future production models, and an innovative mild-hybrid Kia Sportage concept – have an average CO2 figure of just 108 g/km.